The other day I was driving along, thinking about what I most wanted to share with you, based on all my years of helping people enjoy lasting success. I decided that people love lists, and love free, helpful tips for keeping themselves healthy happy. So I sat down late last night after my wife went to bed and wrote down the 10 best things I think Christians can do to radically improve their mind, spirit and body. 1: Live a God-Centered Life! – If you will concern yourself less with what man thinks of you and says about you, and more with what God thinks of you and says about you, you will lose at least 50% of your problems overnight — and more than a few unwanted pounds! Keep your spirit vibrant! – God is spirit, and his worshipers must worship in spirit and in truth. (John 4:24) We can only nurture our spirit by staying connected to He who is thesource of our spirit! Those who live according to the sinful nature have their minds set on what that nature desires; but those who live in accordance with the Spirit have their minds set on what the Spirit desires. The mind of sinful man is death, but the mind controlled by the Spirit is life and peace. (Romans 8:5, 6) Enough said? 3: Take Jesus At His Word And Live Your Life! – The thief cometh not, but for to steal, and to kill, and to destroy: I am come that they might have life, and that they might have it more abundantly. (John 10:10) He is talking about YOU. 4: Don’t Worry — About Anything! – Worry is actually a message from you to God that you don’t really trust Him, and you don’t think He has things handled. Feeling worried? Time to go reread The Sermon On The Mount, especially Matthew 6:25-34. 7: Prioritize Self-Care! – God’s Word tell us no less than 10 times to “love your neighbor as yourself,” So the Lord presumes you are already loving yourself, and He is simply asking you to also love those around you. Indeed, if you do not love yourself, how can you love others? Just as you can’t give water from and empty well, you also can’t give to others what you don’t already have. It’s OK to love the person in the mirror. Get it?! 8: Get Some Exercise! – Remember, God gave you three precious gifts — your mind, your spirit, and your body. Which of these great gifts do you think it would be OK with God for you to ignore, neglect, or disrespect? Exercise all three, every day! 9: Watch Portion Size! – We already understand that gluttony is a sin. And Proverbs 23:2 suggests that you…put a knife to your throat if you are given to gluttony. That may be a bit drastic. But what constitutes gluttony? Maybe less than you think — which also describes many people’s notion of what an ideal portion size is. I tell you, if you will simply reduce your portion sizes, you can lose weight without having to give up any of the foods you love! #10: Drink LOTS Of Water! – I don’t know of a Scripture for this, though the Bible pairs up “water” and “life” several times. But I do know from decades of experience that most of us don’t drink enough water. Water plays a greater role in both healthy and shedding fat than most people are aware of, so drink at least one ounce of water for every two pounds of body weight every day. Your body will thank you! In the business world, it stands for “Keep It Simple, Stupid.” And even in the non-business world, we humans do have an unfortunate tendency to overcomplicate things. Since God created us, He obviously knows all about this problem — which is probably why He gives us so many clear and simple instructions in the Bible. In keeping with the “clear and simple” theme, today I’d like to lay before you three simple Biblical steps that will allow you to get safely to your healthiest weight and stay there, without diets, drugs, pills, surgery, stress, struggle, or backsliding. In a nutshell, we need to (a) have a vision of where we want to go, (b) have the faith that we’ll get there, and (c) take appropriate action. So the very first step toward lasting good health is to have a clear visual image of how you would like to look and feel. Then you need to have the faith that being there is part of God’s plan for you. And finally, you need to take action that is in keeping with your vision and your faith. Now let’s look at the Scriptural foundations of these Three Simple Steps. Perish? Wow, that’s a really strong word! But without a vision to guide us, we may wander aimlessly and endlessly, and never get any closer to victory. It also helps to understand that the word “vision” actually has two meanings in this context — what God reveals to you, and what you can “see” without your eyes. Can you “see” yourself having a trimmer and healthier body than you do right now? Can you envision your Temple being a truly fit dwelling place for the Holy Spirit? Honor God with your body. That instruction is about as simple as it gets. The word “faith” appears 246 times in the Bible (NIV) Amazingly, just 16 of these are in the Old Testament, while fully 230 mentions of “faith” are in the New Testament. What does this mean to you, as a Christian? It means that you need to be very aware of God’s emphasis on faith for Christians — on “believing” that God has your solution ready and waiting for you. In fact, if you search out the word “believe” in the Bible, you reach the same conclusion. Out of 150 times the word “believe” is mentioned, 130 are in the New Testament. What’s the message here? That YOUR faith, YOUR belief is very, very important! Of course, it’s possible to have faith / belief in negative outcomes as well as positive ones. And sad to say, most people who stay overweight do indeed have “faith” that they will stay that way. They have, over time, developed “self-sabotaging” beliefs that virtually guarantee they’ll be overweight. (That’s why renewing your MIND is a key component of improving your health). What does Jesus say about faith? Jesus clearly states that, “Your heavenly Father knows [what you need]…” So if that’s the case, then all we have to do is sit back and wait for Him to drop whatever we need into our lap, right? And of course, that includes having our Temples be trim and in-shape. Won’t God make us thinner and healthier just because He knows that’s what we need? No! The fact that God knows what you need doesn’t mean that He will drop it into you lap, but that He will show you how to get it! Now faith / positive belief is absolutely essential for replacing failure with victory in our Christian lives. But faith alone is not enough. To understand why, we turn to the teachings of Jesus’ own half-brother, James — who provides the kind of hard-hitting wisdom that no Christian can afford to ignore. Dead? Wow, once again, the Bible doesn’t mince words. And James repeats this thought at least seven times in his book. Do you want to be “justified” in God’s eyes? Do you want your Temple to be a fit dwelling place for the Holy Spirit? (b) waiting for God to make them thin. You see, God gives us tremendous power over what happens in our lives, even including whether we get saved. But He won’t do for us what we can — and should — be doing for ourselves. He doesn’t make us fat, and He won’t make us thin. But He absolutely will support us every step of the way when WE step out in faith and take positive ACTION to support our faith. Helping you take the kind of action that will heal your body and your life is what this website is all about. Note that Jesus says, “…not only can you do…” Who does He say is going to “do” something? you are! This is so very important — to understand that Jesus doesn’t say God will do it for you. He says YOU will do it. He is confirming the power of YOUR faith + YOUR action to bring about YOUR desired circumstance. And if you will simply follow His 3-step Success Plan, you will also succeed! If you’re ready to experience the healthy body and the happy life God designed you to enjoy, I’d love to help you get started! Consider adding this simple ingredient to your diet for all-day energy, melting away pounds, and banishing joint pain. Discover the 5 forbidden foods of the bible right here, and what the Good Book says you should be really eating. 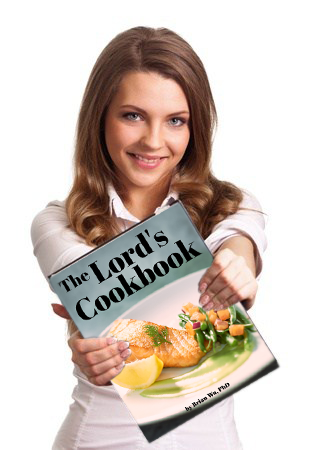 I reveal my underground ‘no-diet’ method to finally getting the body you’ve always desired, using God’s word, right here. Truly we need to be in harmony with the Creator in order to have the peace and happiness we need for a satisfied life. The quotations from scripture are wonderful guidelines. I like the cookbook very much, but Genesis 1:29 says we should eat plants. Also if you suffer from feeling you have sinned because of having had an abortion, look at Genesis 2:7.